“It gives me an immense pleasure to welcome you all to ‘MANIPUR TECHNICAL UNIVERSITY’ with the sincere hope that your stay here will be rewarding and that you will leave as competent professionals capable of contributing significantly to the society and nation. 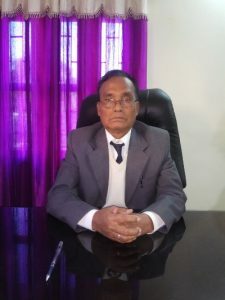 Dean, School of Social Sciences, Manipur University, Imphal. Member of Senate/Court, Academic Council and Syndicate/ Executive Council, Manipur University, Imphal. He has served the Manipur University for about 40 years (1976-2015) out of which 26 years as Professor. He has number of research papers and book publication in his credit.